The Gravity Recovery and Climate Experiment (GRACE) is a twin-satellite system to study in detail the Earth's gravity field. The GRACE data consist of accelerometer, GPS, and attitude measurements from each satellite plus the inter-satellite range change measurements. NASA says GRACE time-varying gravity signals measure seasonal variations in underground aquifers. 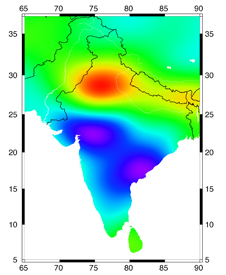 A research team analyzed six years of GRACE gravity data for groundwater storage changes in northern India. The figure below illustrates how groundwater storage varied in that region from 2002 to 2008, relative to the mean for the time period. The deviations from the mean are expressed as the height of an equivalent layer of water, ranging from -12 cm (deep red) to 12 cm (dark blue). Download animation (9 Mb mp4). The averaging function used to estimate groundwater storage changes from GRACE data is shown in a map below. Warmer colors mean greater sensitivity to water storage changes. 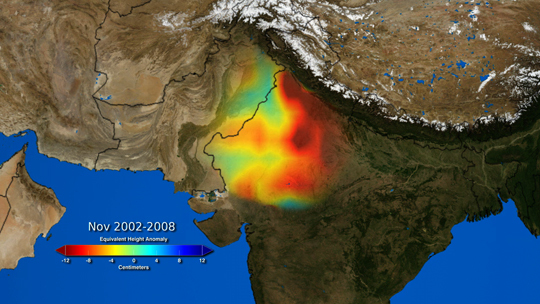 The next map shows the groundwater changes for India, with losses in red and gains in blue. The rate of depletion of groundwater in northwestern India was 4.0 centimeters of water per year, or a water table decline of 33 centimeters per year. 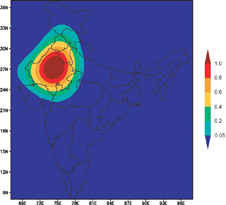 The increases observed in southern India were due to above-average rainfall. However, rain in northwestern India was close to average while human activities continued to deplete the groundwater at a faster rate than the aquifers could be replenished by natural processes. One of the team members, James Famiglietti summarized: "For the first time, we can observe water use on land with no additional ground-based data collection. This is critical because in many developing countries, where hydrological data are both sparse and hard to access, space-based methods provide perhaps the only opportunity to assess changes in fresh water availability across large regions."